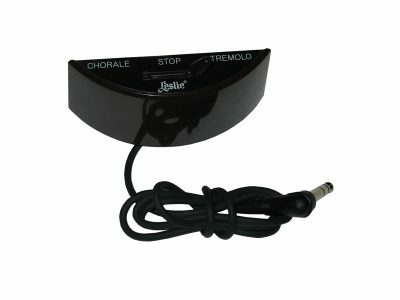 This half-moon shaped switch assembly is used to control the fast (Tremolo) and slow (Chorale) speeds of the Leslie speaker that is connected to these products. This switch assembly mounts to the front rail via the two thumbscrews provided and can easily be removed for transportation purposes. The Tremolo/Chorale switch plugs directly into the foot switch jack on these organs.